We don't have an exact birthday to celebrate the formation of the Grand Canyon millions of years ago, but since President Woodrow Wilson declared the area a national park a century ago on Feb. 26, 1919, Arizona can do something to honor that occasion. 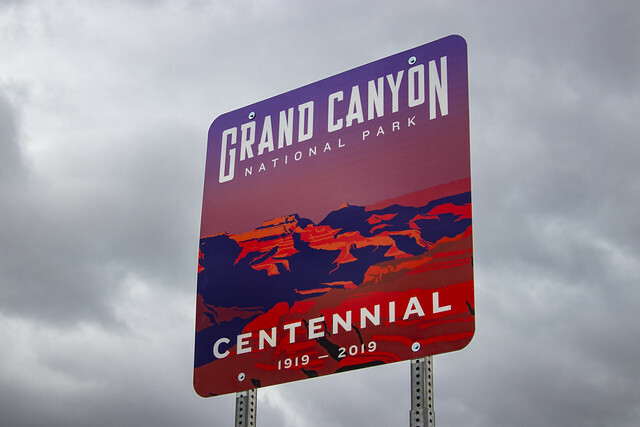 That's why ADOT crews have been out this week installing dozens of signs along our state highways celebrating 100 years of the park welcoming people to one of the natural wonders of the world. You can see the new signs and some of the installations in the Flickr album above. Some of these signs, unveiled by Gov. Doug Ducey last month, will be replacing ones erected to celebrate the state's centennial back in 2012. If you ever wondered about the standards behind highway signage, you can see the manual of approved signs on our website. You can also watch our director visit our sign shop several years ago to learn about what goes into producing a highway sign.